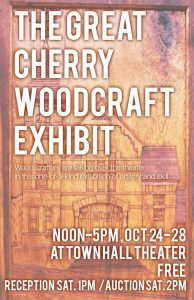 Don Perdue and other Vermont woodcrafters are taking over Middlebury’s VT’s Town Hall Theater in a one-of-a-kind exhibition of artistry and skill. A stunning pile of cherry planks has been drying in a barn for over 60 years. The planks range in size from 5-18 feet and are over 2 inches thick. 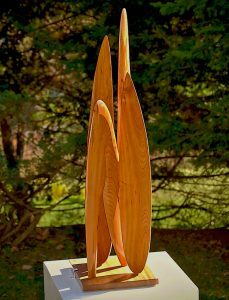 Don Perdue will be displaying his new 37″ high sculpture Summer Sylph, created in this cherry wood donated by Peter Langrock and his wife that made this event and the resulting works possible. Town Hall Theater asked area woodworkers to create interesting, imaginative items out of this beautiful material. Tables, chests, cutting boards, sculpture,- there are no restrictions. Much of the fun of this exhibit is to see what the artisans dreamed up. You won’t be disappointed! The theater is open to visitors Tuesday – Friday, noon 5pm. Items on display are available for purchase at the exhibit and half the proceeds will go to Town Hall Theater. Items not purchased will be up for auction Saturday, October 28 at 2pm. Please join the artists for a reception prior to the auction at 1pm.